ESPN.com: Page 2 : Beach party! ATHENS, Greece -- The official motto of the Olympics is "Swifter, Higher, Stronger." But the unofficial motto of Olympic beach volleyball is "Show us some skin!" Jim tells us he's moving to Norway after the Olympics end. The stadium announcer declared, "Beach volleyball is one Olympic site where you will never hear the words, 'Silence please!'" -- and he was right. By the end of the night, I couldn't even hear myself talk -- not that I could speak in anything but a drunken slur. An all-day party that doesn't end until midnight (or whenever the beer runs out), beach volleyball provides everything a fan could want in a sport: sand, sun, beer, loud music, fantastic athletes, exciting matches, incredible performances, people waving flags of every nation, crazed Brazilian fans and, of course, beautiful women in bikinis. I seriously doubt that Olympics founder Baron Pierre de Coubertin would have approved of beach volleyball. But big deal. It's such an entertaining, international celebration that I'm pretty sure I saw Kofi Anan dancing the Macarena at one point. While many events here are being held in front of half-empty arenas, beach volleyball was a complete sellout on Thursday night. I paid 40 Euro (about $50) for a ticket from a scalper, but I was just happy that I didn't have to pay a cover charge and listen to a bouncer warning me not to touch the girls. Not to imply that the athletes are scantily clad or anything, but even the bar manager at Hooters would refuse to serve them. True, the men wear long, loose-fitting shorts, tanktops and baseball caps when they compete. But the women wear little bikini bottoms and jog bras. I know this will sound incredibly sexist, but I was really pulling for the Norwegian pair on Thursday, on the slim chance that they would celebrate a victory by taking their tops off. The action in the sand is always intense. And yet, all that skin still isn't enough for beach volleyball. Oh, no. Just so that you can't possibly get bored, there is also the bikini dance team, which runs onto the sand to huge applause during every break in the action. They make the Laker Girls look like an Amish quilting circuit. The bikini squad dances to a bad mix of songs pulled off bootleg Jock Jam CDs and old LPs stolen from your weird uncle's collection. Here is a partial playlist from Thursday night: "Uptown Girl;" "Centerfold;" "Doo-Wah Diddy;" "Proud Mary;" "YMCA;" "Volare;" "Respect;" "Hey Ya;" "Tubthumping;" "Booty-licious;" "A Little Less Conversation;" "That's the Way (I Like It);" "Crocodile Rock;" "Satisfaction;" "Tequila;" "Hot Stuff;" "Give Me Some Loving;" the themes from "Aquarius," "Rocky," "Friends" and "Austin Powers;" "Iko-Iko;" "The Blue Danube Waltz;" and the particular crowd favorite, Barry Manilow's "Copacabana." At one point, and I swear I'm not making this up, we were all doing the Wave in slow motion to Zorba's theme. As the music sped up, so did our wave; and by the time the bouzouki reached its frantic crescendo, even reporters in the press tribune were caught up in the tsunami. There are three public-address announcers -- one speaking in Greek, another in English, a third in French and all three speaking the cheesy language of public-address announcers everywhere. The English announcer spoke with the sort of deliberate diction, cadence and accent that gives the impression he learned the language from the "Terminator" movies. When he tried to rile up the crowd by shouting, "Where are the fans from the Czech Republic? ", I expected to see snarling Dobermans rush their section. You just don't see this kind of entertainment at the trap shooting venue. "Look at the Brazilian fans!" he told us at one point, an instruction that really wasn't necessary given that it is impossible to ignore the Brazilians at any time or any place. 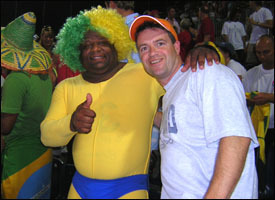 I don't know whether the Brazilians are the world's greatest fans, but they certainly are the least inhibited. They all wear neon yellow shirts, and one particularly large man on Thursday was costumed in yellow long underwear with a bright blue Speedo pulled over them. He also wore a green and yellow wig and carried a microphone so he can lip-synch to all the songs while he danced. He was a cross between Superman, Elvis and the "John 3:16" guy, only more over the top. But don't get the impression that there wasn't some superb, serious competition going on. These volleyball players are truly amazing athletes, flying and diving around the sand like Robin Williams on coke. Just when you think they can't possibly return a shot, they come leaping from behind David Hasselhoff and Yasmine Blythe to get a fist on the ball and swat it back over the net. Then they scramble to their feet and dive over the Coppertone stand for the return shot. I got so worn out watching them I had to get another beer after the first match. As you watch some athletes, you marvel at their enormous talent and dedication. Other athletes make you shake your head at their incredible stamina. With others, you simply wonder whether they have to pay postage for their BALCO shipments. 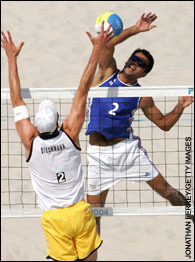 With beach volleyball players, however, you wonder how much sunscreen they go through in a season. We haven't heard from Jim since he left to party with the Brazilians. Brazil's Ricardo Alex Santos and Emanuel Rego smoked Americans Stein Metzger and Daxton Holdren, with Metzger reacting to every lost point with a pained expression that would shame John McEnroe. Americans Misty May and Kerri Walsh ran their record to 3-0, however, by beating the Czech pair. Still, the most impressive performance of the evening was by a German fan near the beer stand, as he guzzled several bottles of Heinekin at the same time. The Greek women beat the Norwegians in three sets in the night's last match. Or, I should say, in the last match at the volleyball stadium. I think the competition actually continued -- they just shifted the venue to the nearest disco.